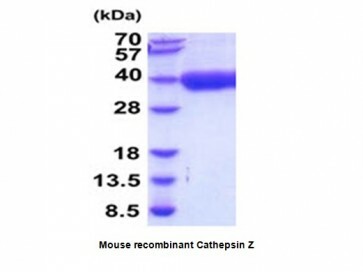 Cathepsin Z, mouse recombinant | 9233 | BioVision, Inc. This protein is fused with a 6× His tag at C-terminus and has a calculated MW of 32.8 kDa. The protein migrates as 28-40 kDa in SDS-PAGE under reducing conditions. 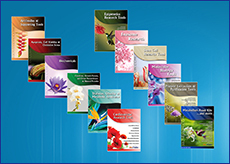 CTSZ, also known as cathepsin Z/X, is a relatively new cysteine protease of the papain family. Compared to other members of the papain family, CTSZ has a short proregion and unique insertions. Acting as a carboxypeptidase, CTSZ displays a unique specificity. Recombinant mouse CTSZ, fused to His-tag at C-terminus, was expressed in insect cell and purified by using conventional chromatography techniques.